During two hours of concert and highly entertaining show program, the traditional tyrolean music ensemble Gundolf will make you discover the entire range of Alpine folk music and traditional country dance art in Tyrol. Listen to famous tyrolean, austrian and international melodies played on traditional music instruments like the "singing saw", the alphorn, the zither and the hammered dulcimer, experience the fascination of a well performed yodelling song and watch sportive young people from Tyrol perform the Schuhplattler dance, which is said to be the oldest surviving European dance going back to the Neolithic. 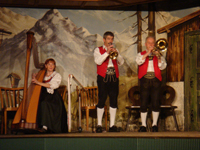 We guarantee that you won't regret having attended a tyrolean folk music show with the Gundolf family!